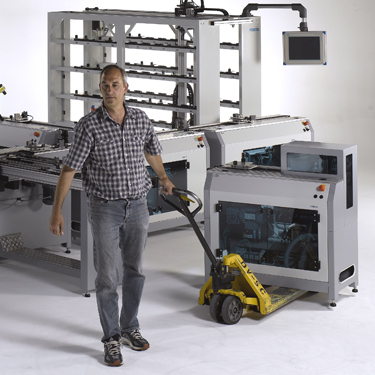 Need to convert an entire production line during lunch? Reacting to new market demands at short notice – is it even possible? ...so that you can react quickly to market turbulence? The iFactory is the convertible training factory everyone dreams of, not just production planners. The iFactory has a systematic modular construction, enabling you to try out new ideas immediately realistically. The adaptability of the iFactory makes modification simple and enables you to create completely new production layouts in just a few moments. Simple and clear interfaces make for intuitive handling and operation – the key to creative production planning and engineering. The iFactory training factory produces different table sets according to each individual customer order. RFID technology in the workpiece holders enables each stage of the production process to be tracked. Many different variants of the product can be produced by varying the material and the mounting position used. This means you can use the iFactory training factory to examine and train the complexity of a modern production process – right down to batch 1. All production cells are constructed professionally and to industrial standards, with no compromises. 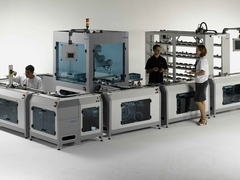 Training in the factory reflects industrial reality, whether at a manual workstation, in the warehouse or at a fully automatic robot work cell. It's not just the products produced using the training factory that are subjected to constant quality testing. All iFactory production cells are also assembled, wired, programmed and thoroughly tested before use. All production cells are equipped with topology feedback so that the master computer – an SQL server – automatically recognises the constructed production line. All system settings and configurations are generated automatically while arranging and connecting the iFactory cells. The SCADA system includes a PC with a control cabinet and its own control system. All cells are networked using the SCADA system. In addition to order input, it allows complete operation and monitoring of the entire production line.